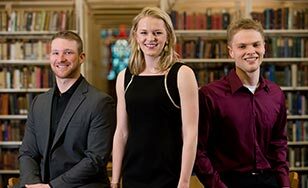 With nine multiple choice questions, developing a survey like the one created by CSS economics students Teddy Glass ‘14, Sam Hoffman '15 and Kailee Odgen ‘15 sounds like the kind of assignment that most students love. Quick, easy and painless. "It was pretty tense," Glass said. Why did a simple survey elicit this level of anxiety? Probably because this was no survey for class. It was a survey for the Regional Economic Indicators Forum. Created, funded and coordinated by the National Bank of Commerce in Duluth, the project is a partnership between the University of Minnesota Duluth, the University of Wisconsin-Superior and the College of St. Scholastica, who together research and evaluate the economic health of the Northland on an ongoing basis. This is the project's first year, and, apparently, there's plenty of demand for it. "There really isn't a whole lot of data like this for businesses in this region to use, so one of the overarching goals of the project is to bring that data and perspective to businesses," Hoffman said. "That'll allow them to see how local economy is functioning - what pieces are flourishing and what pieces aren't - and use that to more accurately adjust and make judgments." With stakes as high as this, the task sounds more suited to professionals than students. So not surprisingly, finding the right team required a search process more corporate than collegiate. Professors Anthony Barrett, Robert Hoffman and Jennifer Pilon - who are CSS's representatives at the Forum - sent out an email to qualified students. Those interested had to apply, sending a resume and cover letter, and, if selected, interview with them - professional attire and all. And despite their fashion differences (Glass went all-out with a suit), the three were selected in November 2013. But that provided little relief right away. "Everything was so brand new to everybody. We were just given the instructions and told to go, we didn't really know where to begin" Glass said. "Even our professors didn't know about the Qualtrics software we had to use to do this." But they dove right in anyway. They knew their role was to assess the business confidence of a territory covering 15 counties in northeastern Minnesota and northwestern Wisconsin. To do that, they needed to create surveys and send them to the roughly 15 Chambers of Commerce within the area, who would then distribute them to the businesses. Yet the businesses didn't have to respond, which is why creating a survey with quality questions was so important. And that's where the tensions came in. "We argued about the details of the questions a lot," Glass said. "With our personalities, we all wanted it to be perfect - to be thorough and detailed to ensure we'd get a good response." These arguments were really more like debates. They were healthy, constructive, a product of getting three meticulous, smart students talking about the best way to word a question and how businesses would react to that. And, above all else, they were productive. "It's an interesting experience for me being the only girl working with two other guys," Odgen said. "I often play the role of devil's advocate and they could say, ‘well, it's two against one,' and go with what they think. But they really tried to understand where I was coming from and we truly made all the decisions as a team." In fact, all of them agreed that the meetings where all of these debates occurred were their favorite part of the process so far. And it shows in their attention to detail. Realizing they needed their questions to be broad enough to compare small and large businesses and crafted in a way that the businesses' identities could be kept secret - a key aspect in today's highly competitive market - they used qualitative questions to assess things such as hiring patterns, general business activity, capital expenditures, the effects of the Affordable Care Act and factors limiting the availability of certain business components - both six months ago and now. This precision paid off, as they received a good response in more ways than one. Not only did many businesses complete the survey, but the results Hoffman presented to a crowd of 260 businesspeople at the Forum on March 25 were also positive. They indicated that the region's economy is trending upward and is expected to continue to do so in the coming months - with insufficient demand, competition, weather conditions, shortage of skilled labor and government policy serving as the largest impediments to further growth. Hoffman even had the chance to discuss these findings on WDSE's March 28 Almanac North program. This can be viewed at http://www.wdse.org/shows/almanac/watch/almanac-north-mar-28-2014. Now, Glass, a senior, will attend law school in the fall (though he hasn't decided where yet). But Odgen and Hoffman will be back to continue the group's work next year, along with two newcomers. "I genuinely enjoy spending time with these two. We all get along and are comfortable voicing our opinions," Hoffman said. "It'll be tough to top this group next year." For more information, view the Forum's final report (pdf) or view it on the website.